In the summer of 1991, researchers at the European particle physics laboratory CERN released a program called the World Wide Web. It was a set of protocols that ran on top of the Internet protocols, and allowed a very flexible and general-purpose access to material stored on the Internet in a variety of formats. As with the Internet itself, it was this feature of access across formats, machines, operating systems, and standards that allowed the Web to become popular so rapidly. Today most consumers consider the Web and the Internet to be synonymous; it is more accurate to say that the later was the foundation for the former. The primary author of the Web software was Tim Berners-Lee, who was working at CERN at the time. He recalled that his inspiration for developing the software came from observing physicists from all over the world meeting together for scientific discussions in common areas at the CERN buildings. 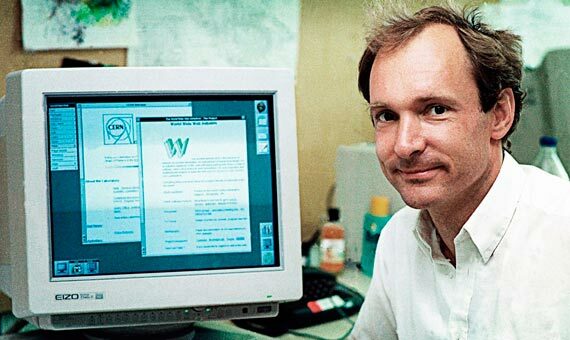 In addition to developing the Web, Berners-Lee also developed a program that allowed easy access to the software from a personal computer. This program, called a “browser,” was a further key ingredient in making the Internet available to the masses. Berners-Lee’s browser saw only limited use; it was soon replaced by a more sophisticated browser called “Mosaic,” developed in 1993 at the University of Illinois in the United States. Two years later the principal developers of Mosaic left Illinois and moved to Silicon Valley in California, where they founded a company called Netscape. Their browser, called “Navigator,” was offered free to individuals to download; commercial users had to pay. Netscape’s almost instant success led to the beginning of the Internet “bubble” whereby any stock remotely connected to the Web was traded at absurdly high prices. >> Excerpt from Paul E. Ceruzzi’s essay “The Trajectory of Digital Computing”.